There are a variety of galleries along Flinders Lane; if you want to see a variety of different types of galleries then walking down this lane is an education. These types of galleries vary on the way they select the art and are funded. Most of the galleries, look similar, white walled rooms in converted buildings. Only the powerful Anna Schwartz Gallery is in a contemporary purpose-built building. When visiting the galleries on Flinders Lane I like to get out at Parliament Station and start with Craft Victoria because this means that I will be walking downhill rather than uphill. Craft Victoria’s exhibitions are regularly amongst the better contemporary art exhibitions that I see. 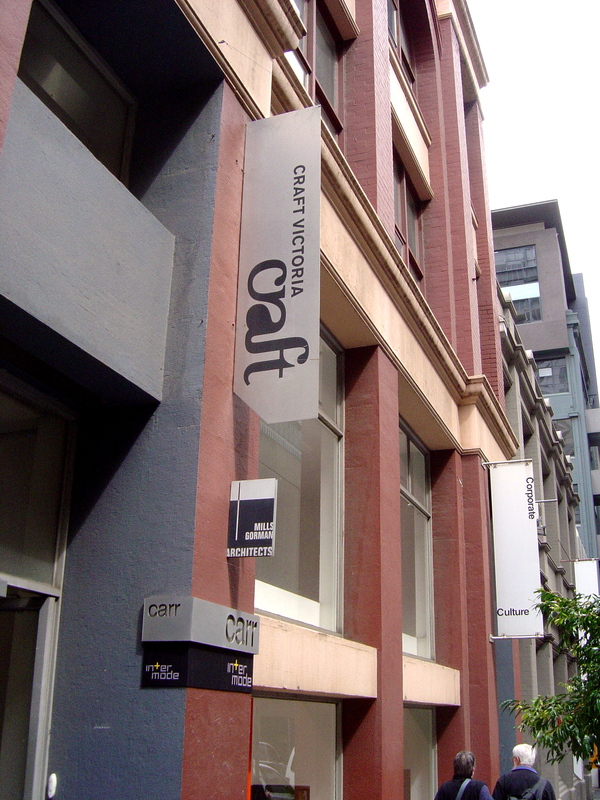 Craft Victoria is a government funded gallery; it is funded by all three levels of government, federal, state and local along with corporate sponsorship and membership of the professional craft association. It also has a gift shop with a fine selection of high quality local craft products. 45 Downstairs is a not-for-profit theatre and gallery space that was founded by Mary Lou Jelbart and Julian Burnside in 2002. 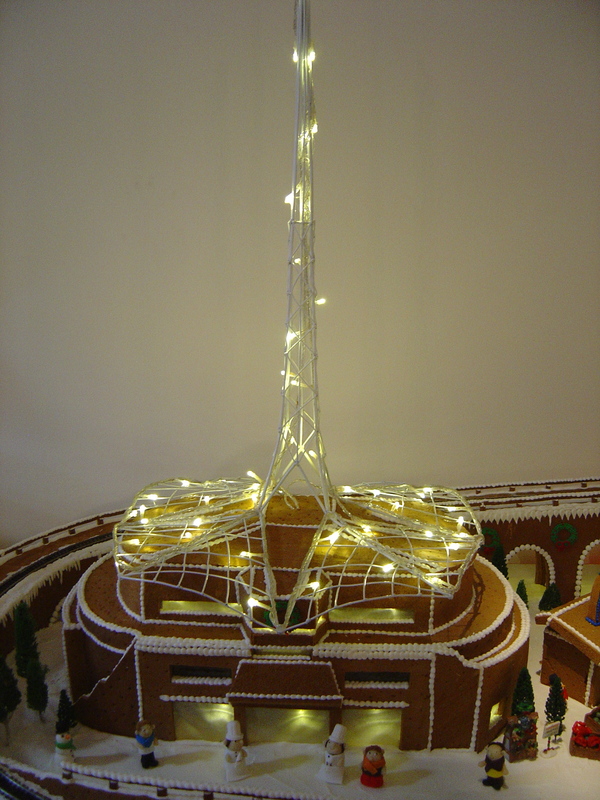 Exhibitions are by application and it is funded by rental of the space and donations. Mailbox Art Space is an artist run space is a series of mailboxes that have been converted into one of Melbourne’s smallest art spaces. Exhibitions are based on an application and it costs nothing to exhibit. There is also community access gallery on one wall of the upper floor of the City Library. Exhibitions are based on an application by “artists in the early stages of a professional art career”. It costs $800 to exhibit in the gallery for the month, substantially lower than other far less attractive rental spaces in Melbourne, as the costs of the space are mostly funded by the City of Melbourne. 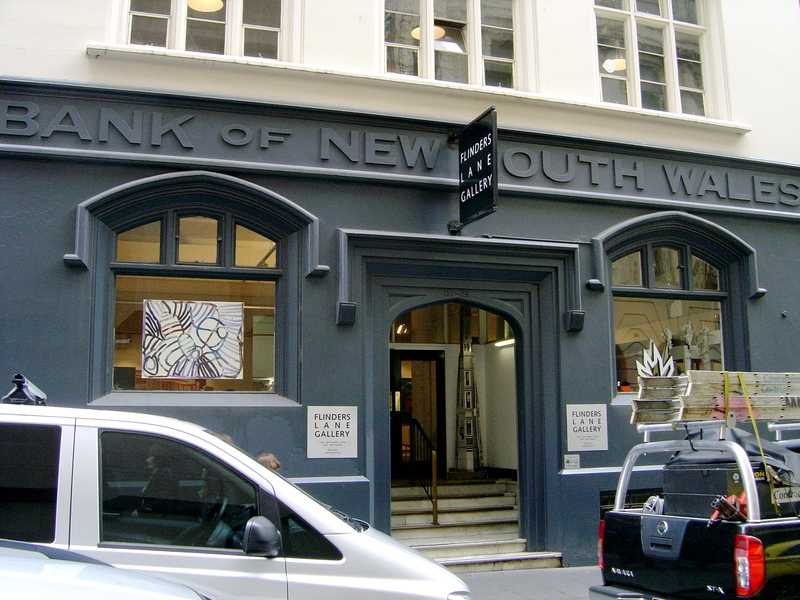 The majority of galleries in Flinders Lane both historically and currently are commercial galleries, like Arc One, Anna Schwartz and Flinders Lane Gallery. These galleries select their artists from a stable of artists that the gallery represents. Flinders Lane Gallery opened in 1989 and is the oldest of the exiting galleries on the lane. It represents “emerging, mid-career and Indigenous Australian artists”. When I last walked along Flinders Lane last weekend Arc One and Flinders Lane Gallery were both having shows from their stockroom, group shows of the artists that they represent. It is always interesting to see a commercial gallery’s stockroom for the same reason that a stockroom show is interesting. Australian Galleries used to have a whole building in Collingwood devoted to their stockroom but it has now closed. In contemporary galleries a stockroom may not be a drab utilitarian store room, Fehily Contemporary has an attractive upstair’s ‘stockroom’ that would put to shame many people’s lounge rooms. For more on different there is my earlier post on types of art galleries. Two exhibition at Flinders Lane Gallery both with a theme of birds. In Jon Eiseman’s exhibition “Other Realities” the birds are in symbols of the mind transcending the surface reality. Like Max Ernst or local artist, Kevin Mortensen Eiseman has the head of a bird in his art. Symbolically birds and fish are creatures that regularly move from the surface world into other worlds/realities. In Eiseman’s small bronze sculptures a Magritte-like everyman in a suit, a traveller with suitcases inhabits a world of birds and fish. Eiseman’s fantastic world has an enchanting sense of poetry that translates into a photographic collaboration with Anne Coran. In “The Paper Room” at Flinders Lane Gallery there are works on paper by various artists printing or painting on paper. It is not that exciting except for the two etchings depicting twigs and their shadows by Christine Wilcocks where the handmade paper resembles a sandy ground. I didn’t like Marise Maass’s series of paintings on paper as they looked like small versions of Jenny Watson paintings – more crudely painted horses. At fortyfive downstairs the artists were using paper not simply as a support for the art but as the medium for the art. Curator, Sally McKittrick has done a great job at bringing together 10 artists who make art from paper. The artists have animated, cut, carved, bent, folded, knitted, punched and woven paper. I was particularly taken by the music boxes by Adam Simmons where the punched paper rolls are both elegant sculptural forms and information storage. The connection between plants and paper features in this exhibition as paper is often made from plant fibre pulp. Lan Nguyen Hoan has a made field of paper grass and has animated it in a video. Claudia Gleave and Sara Nothrop construct imaginary paper plants in glass jars. And Alana Sivell also created plants from paper. This is just the work on and from paper in two of Melbourne’s galleries. The paperless office may still be a long way off but the paperless art world isn’t even a vision of the future. “London Works” by James Cochran at Lindberg Galleries are portraits of homeless men. What is remarkable about these paintings is that they were created primarily with aerosol paint. The faces and hair are made up of hundreds of dots of aerosol paint, each dot with its own small drip. Cochran’s paintings are like pointillism with a spray can. There are lots of drips in the paintings – drips are currently very fashionable in street art. James Cochran (aka Jimmy. C) is a veteran street artist from Adelaide. It is remarkable for how far street art techniques have permeated mainstream art in the last decade. Cochran’s paintings are obviously clever, technically excellent but superficial and sentimental. These are the kind of paintings normally seen in commercial galleries located in the foyer of five star hotels. Perhaps the paintings could even hang in part of the hotel, a private dinning room; a place where the homeless men depicted in the paintings would never be admitted. The sentimental depiction of homeless by artists over the centuries has not helped changing the conditions that lead to homelessness. I suppose the homeless make cheap models. You need more than one trick to make good art and technique will only get you so far. The second trick, the right subject for the art, has to work with the technique. At Flinders Lane Gallery there was an exhibition of paintings with more than one trick – Margaret Ackland “Histories”. Margaret Ackland’s main trick of painting transparent fabric, lace, tissue paper and even plastic wrapping, with light paint strokes. Her compositions on the dark background make the cloth and paper glow like old masters. Some are dynamic flows of fabric are static and meditative. Ackland’s other trick is her references to the history of fashion; her sense of the histories that clothes tell. Not that all her clothes are old fashioned, there is a beautiful painting of an empty plastic dry cleaning bag and clothes hanger. I particularly enjoyed her paintings of pictures partially unwrapped from tissue paper that have a sense of the rediscovery of an archived image. Both Cochran and Ackland have excellent painting techniques but Ackland does better paintings because of her choice of subjects.